We did indeed win our fifth straight series! It was awesome. It was totally awesome. The Jays didn’t even know what hit them, and now we have a new best record we’ve ever had so far this year! Lester pitched really well. He gave up four runs on seven hits while walking none and striking out four over seven innings. He gave up two home runs, a solo shot to lead off the fourth and a two-run shot with two out in the sixth. The only run he gave up that was not the result of a long ball occurred in the first; the Jays led off the game with a double, and the run scored on a single in the next at-bat. He threw one hundred pitches. The second, third, and fifth were one-two-three innings. His longest inning was the sixth, during which he threw twenty-three pitches. His lowest inning pitch count was nine, which he threw in both the second and fifth. His cut fastball was excellent, and his curveball, changeup, and sinker were all very effective. But, believe it or not, as good as Lester was, the offense collectively was even better, which Lester clearly deserved because he hasn’t been supported well at all. The final score was 10-4, so we definitely took some batting practice. We didn’t waste any time, either. We sent ten men to the plate in the first alone. Nava walked on four pitches, and that should have been the clue to the Jays that they were about to have a long, long night. He scored in the very next at-bat, when Pedroia doubled him in. Then Papi walked on four pitches, just in case the Jays didn’t get the hint the first time, and then Ross singled to load the bases. Gonzalez reached on a force attempted thanks to an error, which scored two. Middlebrooks then grounded out, which scored another, and Aviles singled, which scored another, and McDonald singled, which scored another. That’s four straight scoring plays. But we were just getting started. With one out in the second, Papi and Ross worked back-to-back walks on five pitches each, and Papi scored on a single by Gonzalez. We took a break in the third but returned to our onslaught in the fourth. Papi led off the fourth with an extremely patient, eight-pitch walk, and Ross doubled him to third. He scored on a single by Gonzalez. 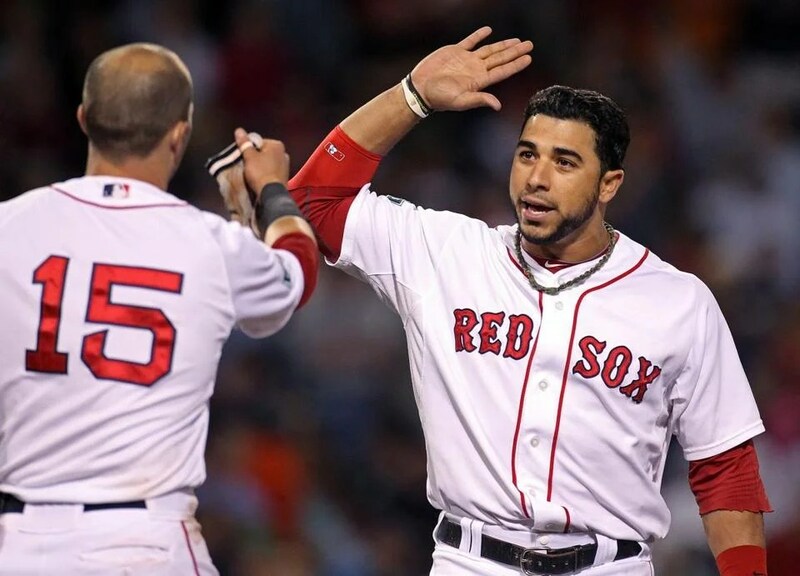 After Middlebrooks struck out, Aviles brought Ross home with a double. 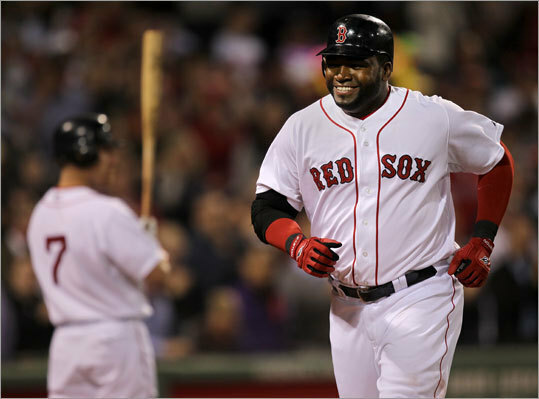 With one out in the fifth, Papi smacked a solo shot on his second pitch, a ninety-two mile-per-hour fastball. It was one of those swings where you knew it was going out of the park the minute the bat made contact with the ball. I think he just got tired of walking. Now he’s got only one more for four hundred! Then we were done. We went down easily in order in the sixth, seventh, and eighth. Meanwhile, Melancon had pitched the eighth, and Mortensen had pitched the ninth. Lester was rewarded with the win. Gonzalez went two for five, Aviles went two for four, and Ross went two for three. Papi only went one for two, but with three walks. He also scored four runs, which tied his career high. Half of our hits were for extra bases. Defensive highlights included McDonald’s truly incredible jumping catch to put up the first out of the ninth. It would have been a home run for sure, but McDonald leaped at just the right time and just the right angle to catch the ball in its arc over the bullpen wall. He actually landed on the wall and didn’t even go over it, and Mortensen gave him a very well-deserved tip of his hat. I guess we like the extremes. On Tuesday, we needed heroics in the late innings; yesterday, if we didn’t score any runs after the first inning, then all else being equal, we still would have won. And we can feel proud of having won seven of nine games at home before heading back on the road. I can hardly believe it but we’re actually tied with the Rays for third place now. Now, that’s more like it! Especially with Dice-K pitching well! Admittedly, he didn’t pitch long, but let’s remember that our expectations unfortunately shouldn’t be too high at this point. But we can celebrate coming back in the late innings to win it; it shows resilience, strength, and a never-say-die attitude. We needed a win like this to keep our momentum going, our spirits up, and our record intact. He pitched five and two-thirds innings and gave up one run on six hits. That one run was the only run the Jays would score all night. In the first, Dice-K gave up a double, followed by a fielder’s choice. Then there was a popout followed by an RBI single, and that was it. (Incidentally, Middlebrooks made another error that allowed a runner to advance to third on the following play. Fortunately, it didn’t result in any damage, and all else being equal, even if it did we would have won anyway, but still.) Dice-K also walked one and struck out five. He had a killer cutter last night that was thrown for strikes almost eighty percent of the time. Fortunately he threw mostly cutters and four-seams, which were also thrown mostly for strikes. He threw some curveballs, which honestly were horrendous, as well as a handful of two-seams, changeups, and sliders, which were alright. He also threw a lot of pitches; I guess some things never change. He needed one hundred pitches to get through his outing. Unfortunately, he didn’t get the win. When he exited the game, we were down by one because we hadn’t scored anything and wouldn’t until the seventh, when we saw three different relievers and sent seven batters to the plate. We almost scored in the sixth, though. With one out, Pedroia walked and tried to come home on a double by Papi but was out at the plate. Anyway, the seventh inning began with two quick outs followed by a solo shot by Salty on his second pitch, a fastball down and away. He put it in the first row of Monster seats and tied the game with one swing; it’s always nice when you can do it efficiently with one swing of the bat. Kalish then came in to pinch-hit for McDonald and doubled. Nava then came in to pinch-hit for Lillibridge and was hit by a pitch. Then Aviles walked to load the bases. And then Pedroia singled in two, with Aviles out at third. We scored two more in the eighth to cement the win. 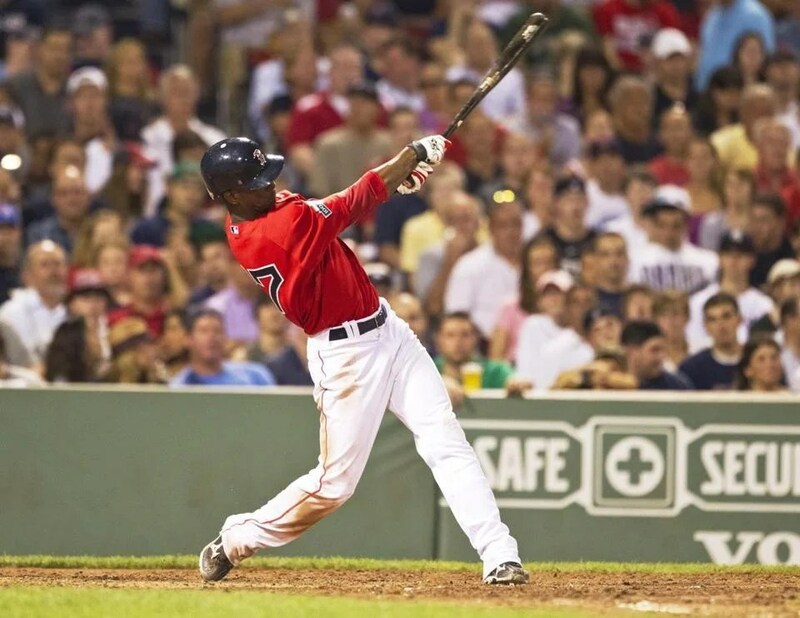 Papi doubled, Ross singled, Papi scored on a double by Gonzalez, and Ross scored on a sac fly by Middlebrooks. Seriously, how many of you thought we were going to lose this one by a score of 1-0? Games like this show you that you can never count us out. It’s good to have a reminder of that every once in a while. Even though ideally you hope we’re never in a situation where we have to come from behind. Atchison pitched the last out of the sixth as well as the first two of the seventh, Miller pitched the last out of the seventh and picked up the win, Padilla pitched the eighth and picked up a hold, and Aceves pitched the ninth. The final score was 5-1. We are now in sole possession of second-to-last place. If we win today, we will have one nine of our last eleven and our fifth consecutive series. Last night was a good, old-fashioned pitcher’s duel. We didn’t lose because we made fielding errors, we didn’t lose because our pitchers made mistakes, and we didn’t lose because we squandered opportunities or even because we temporarily forgot how to hit the ball. We simply lost because, as good as our pitcher was, their pitcher, for one night at least, was better. The match was even. I mean, if you have to lose, you should at least be able to lose with your dignity. Beckett was absolutely phenomenal. You can’t get much better than the performance that he delivered. Actually, obviously that’s not true; it would have clearly been better had he not allowed any runs. But still. Beckett pitched a full eight innings, and he was brutally efficient; he threw ninety-two pitches, sixty-six of which were strikes. Both of his fastballs were practically impeccable. Three-quarters of his two-seam were strikes, and over eighty percent of his four-seams were strikes. Almost three-quarters of his cutter were strikes too. His changeup and curveball were also good and added some variety and nasty speed changes. He was consistent with his inning pitch counts as well, and he got through half of his innings with pitch counts in the single digits. He finished the eighth with nine pitches, the first and fourth with seven, and the seventh, his best inning by far, with only five, if you can believe that. He threw ten in the second, twelve in the third, thirteen and the fifth, and his game high of nineteen in the sixth. He gave up two runs on only five hits. Those two runs occurred, not coincidentally, in that sixth inning. He gave up three consecutive singles to start it, the third of which scored a run. After that, a force out scored another. Then he got out of the inning with a double play. That was really the only blemish. He faced the minimum in his first five innings. That’s over half the ballgame. His perfect game was broken up by a single in the fourth (a double play that inning kept it one-two-three). So the sixth and seventh were the only two innings during which he faced more than the minimum (he allowed another single in the seventh). He walked none and struck out five. Unfortunately, we fared about as well as the Orioles, except for the important distinction of being one run worse. McDonald doubled to lead off the third, Byrd singled, and McDonald scored on a sac fly by Aviles. Two outs later, the inning was over, and so was one of our best opportunities of the night. We began the seventh with two consecutive singles, and with one out we worked two consecutive walks in the eighth, but other than that, it was a single here, a single there. We lost, 2-1. So it really was the sixth inning that did us in, although I’m not willing to say that this was Beckett having one bad inning because, honestly, we’d be lucky if every one of our pitchers at this point had bad innings as benign as that one in the grand scheme of things. Middlebrooks went two for four for our only multi-hit performance, and that double by McDonald was our only extra-base hit of the game. We collected two more hits than Baltimore and left eight on base as opposed to their one. Padilla pitched a great ninth inning; Beckett took the loss. But keep in mind that we may have lost with dignity, but a loss is still a loss. We’re back at .500, and the Orioles are undefeated in our house dating back to last season. This has to stop. Today. Whoever was concerned that it took us thirteen innings just to lose a ballgame need fear no more. Yesterday, the team showed us that it does not, in fact, need thirteen innings just to lose a ballgame. You read right. We played a seventeen-inning game yesterday that we eventually lost. Think about that. That’s basically like playing two baseball games in a row, like a doubleheader without a break in between, except that it’s only one game that you’re trying to hang on to by the skin of your teeth. The whole thing lasted six hours and seven minutes. It was the longest game we played since 2006. So it was demoralizing enough that we couldn’t get the job done ourselves, that both our starter and our offense delivered performances sufficiently mediocre so as to put us in a situation that the game wasn’t won by the time nine innings ended. And it was bad enough that we had to play extra innings at all, just two days after playing another extra-inning game, a game that we lost. And perhaps it was even bad enough that the number of extra innings we had to play was truly astronomical to the point where, as I said, it amounted to a whole other ballgame in and of itself. But on top of all of that, as if all of that weren’t bad enough, we had to go and lose it. We just lost a seventeen-inning ballgame. If we had any morale going into it, and honestly it didn’t really seem like there was much there to begin with, you can pretty much rest assured that we don’t have any anymore. Just to put the outcome in perspective, it really is true that, if you’re going to identify a point at which the game was definitively lost, it isn’t really fair to say that the reliever that allowed the winning run lost it for us. Because the reliever who allowed the winning run, and who therefore took the loss, was not a reliever. It was Darnell McDonald. If you’re going to play a seventeen-inning game, you’re going to run out of pitchers no matter who your manager is. And at that point, Bobby V. was just looking for an arm to send out there regardless of who it belonged to. There was nothing he could do. As a result, acknowledgement must be given to the team’s ability to last that long. I can’t believe we just played a seventeen-inning game; that’s beyond ridiculous. I didn’t think I’d see something like that. It was a marathon in every sense of the word. Everyone was tired and exhausted beyond all capacity to deliver, and yet somehow we hung in there for one more inning, and the next inning, and then the next and the next and the next until something had to give, and that something was the roster of our bullpen. That is to say, the bullpen itself was not at fault. Rather, the bullpen was the only aspect of the team yesterday that shone; it and it alone was responsible for preserving the tie as long as it did. It wasn’t its fault that, by the time its roster was exhausted, the offense still hadn’t done anything to win the game. Now down to the technicalities of it. As I said, if the point of loss is to be identified, it should be identified as the early goings, in which Buchholz yet again provided a sub-par showing. He only lasted three and two-thirds innings and gave up five runs on seven hits, three of which were home runs, while walking four and striking out four. In those innings alone, he somehow managed to throw eight-one pitches, forty-six of which were strikes. Buchholz allowed a solo shot on the first, hit by the second batter he faced, JJ Hardy, on the fifth pitch he fired in total to start the game. He had a seamless second featuring one walk and three strikeouts, which provided a teasingly good reason to believe that perhaps he was going to settle down. But he returned to his disappointing self in the third, when he gave up another solo shot to Hardy. He then gave up a three-run home run in the fourth and was taken out after he allowed two straight singles after that. He is the first pitcher since Red Ruffing did it in 1925 to give up at least five earned runs in six straight starts. The offense woke up in the bottom of the fourth, when Aviles doubled and scored on a single by Sweeney. At that point we had only to score three more runs to tie it. Instead, in the bottom of the fifth, we scored four. Papi singled. Ross singled. Salty walked. And then Middlebrooks, the call-up in response to Youk’s ailing back, absolutely smashed the first pitch he received in that at-bat. It was a curveball. It sailed over the Green Monster seats. Not into the Green Monster seats. Over the Green Monster seats, into Lansdowne Street. Now that’s power. Not only did Middlebrooks hit his first Major League home run, but he hit his first career grand slam. At the time, it was exactly what we needed. Not only did it give us a tie, but it also was a major shot in the arm regarding that oh-so-elusive morale we’ve been trying to find ever since the season started. I mean, not only was it a kid’s first home run, but it was a grand slam! It seemed like the perfect thing to rejuvenate us. 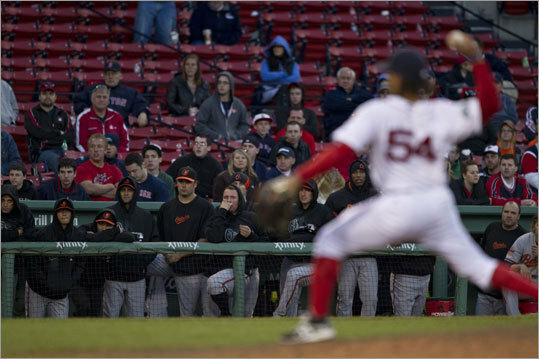 Buchholz had been replaced by Miller, who finished the fourth and pitched a one-two-three, all-strikeout fifth. Miller was replaced by Albers, who pitched the sixth and seventh. Albers was replaced by Padilla, who allowed an RBI double in the eighth, which gave Baltimore a one-run lead. We tied it back up that very same inning when Papi led it off with a double and scored on a sac fly by Salty. It was the last run we’d score all night, and the game remained tied at six for eight more innings. Padilla was replaced by Aceves, who pitched the ninth and tenth. After allowing a single to start the eleventh, Aceves was replaced by Morales, who finished the eleventh and pitched the twelfth. After allowing a single to start the thirteenth, Morales was replaced by Hill, who finished the thirteenth and pitched the fourteenth. After allowing a walk to start the fifteenth, Hill was replaced by Atchison, who finished the fifteenth and pitched the sixteenth. McDonald came on for the seventeenth and opened it with a walk to Wilson Betemit that was promptly erased when Salty caught him stealing second base. But he then allowed a double and a walk followed by a home run of his own. There were a few chances along the way for us to put it away that we didn’t convert. With one out in the ninth, Aviles singled and tried to steal second, but the scenario couldn’t have played out any worse: Aviles was caught stealing right after Sweeney struck out. Our best chance to put ourselves out of our misery was probably the sixteenth; with two out, Byrd reached on a fielding error and tried to score on a double by Aviles but was thrown out at home for what was an incredibly crushing moment, full of such promise one minute and the next minute evocative of what was to come the next inning. Sweeney opened the bottom of the seventeenth with a single, and Pedroia followed with a walk. So it was not inconceivable that we could have rallied. Except for the fact that Gonzalez struck out and McDonald grounded into a double play. So there you have it. We played seventeen innings and hit sixteen hits, five of which were for extra bases. We put up four multi-hit performances; Middlebrooks and Papi had two hits each, while Aviles had three and Sweeney had four. Three members of the starting lineup, Aviles, Sweeney, and Gonzalez, had a game high of eight at-bats each. We went two for nine with runners in scoring position. We were caught stealing twice, turned six double plays, and made three errors (Salty made two of them, a fielding and a throwing error, and Middlebrooks made a throwing error). We trotted out nine different pitchers, one of whom is not even a pitcher. (To be fair, Baltimore’s winning pitcher was Chris Davis, who spiked Aaron Cook and who is not a pitcher either.) For the first time ever, we had a cleanup hitter go 0 for 8 (in case you can’t guess, it was Gonzalez, who apparently offered Bobby V. to pitch if necessary). We lost, 9-6, and were swept by the Baltimore Orioles of all teams for the first time since 1994. We finished our homestand with a record of one and five. The most important thing that Doubront can possibly do today in Kansas City is eat up innings so that the bullpen doesn’t have to come out. Considering that he has yet to pitch through the seventh inning in eight career starts, the bullpen is hoping he’ll step up and deliver. I know it’s the A’s, but I am so relieved that we didn’t let that one loss get us down. As well as we played before that loss, and even though that loss technically wasn’t our fault because objectively speaking Gavin Floyd did pitch a great game, I still wanted to see that we could make it last, maybe not as an infinite winning streak, but as a way of being. A way of being that ingrained itself in the team’s mentality, and a way of being that would be sustainable throughout the season. That’s a lot to put on this one win against the A’s, but then again, if we didn’t win, we’d be that much farther away from achieving it. You have to start somewhere, and this game during this stretch seems as good as any. Buchholz didn’t end up having the most quality of starts, although it certainly started out that way. He gave up six runs on seven hits while walking five in six and two-thirds innings, but five of those runs were allowed in those two-thirds of an inning in the seventh. He gave up an RBI single in the second. He retired the side in the third, fourth, and sixth. And then he totally fell apart in the seventh. He opened it by giving up a single, followed by a walk, followed by a lineout and then a force out, followed by another walk. Then Coco Crisp of all people singled in two. Then Josh Reddick of all people hit a three-run home run. Reddick goes deep, and Bailey is on the DL. Yeah. That worked out real well. Buchholz threw ninety-nine pitches, sixty-three of which were strikes. His best pitch was his curveball, and he also used a very, very effective fastball, changeup, and cutter. So he was absolutely fantastic until the seventh, when he threw twenty-seven pitches before he left. Before that, he was very efficient and consistent; he needed a pre-seventh inning high of eighteen pitches in the fifth and a low of only six pitches in the third. He needed only nine in the sixth, so he was great right down to the wire before he just snapped. I’m telling you, if there’s one thing he’s been consistent about so far this year, it’s his inconsistency. What will it take for him to get on the right track? If not for that seventh inning, this would have been his best start of the season, hands down. He was pretty explicit in expressing his frustration that inning, and I think I speak for all of Red Sox Nation when I say that so were we. Very fortunately for Buchholz, the offense was able to set the table so well that the five runs were scored after we finished scoring all our runs, and it still made absolutely no difference in who won and who lost. Papi got us on the board in the second by leading it off with a solo shot into the bullpen on a full-count fastball. That baseball never stood a chance. After Shoppach struck out, McDonald doubled and scored on a single by Byrd, who scored one out later on a single by Aviles, who moved to second on a single by Pedroia and scored when Gonzalez reached on a throwing error. The very next inning started the same as the first, with Papi setting up the scoring. He worked a walk and set the stage for McDonald’s homer to the center-field part of the Monster one out later on the first pitch of his at-bat. The only question was whether it would require review, since it hit right at the top of the wall. But that clearly was out. The A’s didn’t even ask for a review. We went down in order in the fourth, but Papi more than made up for that by yet again initiating the scoring with yet another solo shot, this one into the bullpen again, also on a fastball. Reddick actually chased this one down so much that he flipped right over the bullpen wall. I don’t even remember the last time I’d seen a ballplayer make a move like that. It was hilarious. The ball grazed his glove, and then he just flipped right over that wall. One out later, McDonald singled and scored on a double by Byrd. Then Punto walked on five pitches, and Aviles brought in two more with a massive three-run shot on a changeup middle in into the first row of the Monster seats. It was indeed massive. We went down in order in the sixth and seventh; Pedroia doubled and Gonzalez walked intentionally in the eighth, but like I said, the final score held at 11-6. Which means that Tazawa, Padilla who received a hold, Atchison, Morales who received a hold, and Aceves all did their jobs and combined to pitch the rest of the game in shutout fashion. Both teams ended up having posted eleven hits, but where two of Oakland’s were for extra bases, seven of ours were for extra bases, four of them home runs, all of which came against southpaws. We went three for eight with runners in scoring position. 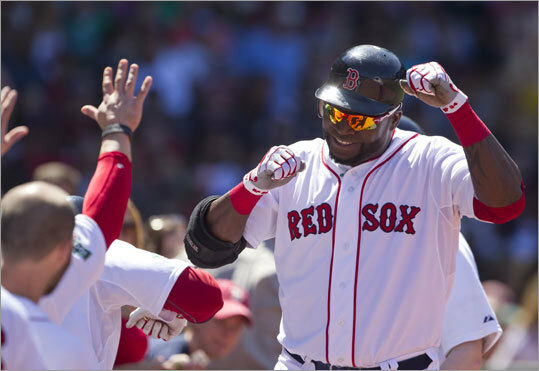 Aviles, Pedroia, Papi, and Byrd each collected two hits, while McDonald went three for four. Let’s step back and look at Papi for a second. Both of his hits were home runs last night, which makes thirty-six multi-homer games in his career. And he has set the team record for hits in April, giving him an average this month of .405, which must be close to the, it not simply the, best in the American League. Still, it was a really good team effort. Everyone chipped in for this one, even the bullpen. Only one member of the starting lineup failed to reach base: Ross. But overall the team as a group pulled it together, which is exactly what you like to see after a tough loss.